From slot toppers and custom game boards to high-definition backlit displays, your intended audience and the information you want to convey will help determine which options are right for you. Optimize wayfinding by using clear, visible signage to help guests navigate between amenities and games to avoid wasting time wandering around or feeling confused. Increase on-site spending by encouraging guests to game longer with jackpot celebrations or by driving sales with tournament promotions. Use eye-catching signage and graphic displays to show off the latest events and promotions to both your guests and employees. Don’t let your event information get lost in the excitement of a casino environment—make your promotions pop with custom, engaging graphics that ensure your events receive the attention they deserve. Our experienced team can not only help you identify the type of casino solutions that are best for your business but can also make recommendations to to help ensure your graphics and signage communicate the right information to your guests. 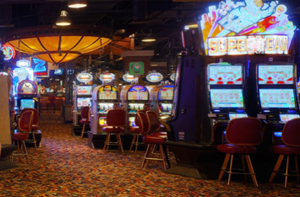 Flashing lights, the sounds of slot machines and excited guests make casinos hubs of powerful energy and activity. Lots of moving parts can create challenges for communication, but engaging, eye-popping signage and displays can help your guests get the information they need at the perfect time and place. Optimize wayfinding – One of the biggest challenges for guests that can quickly turn a good experience into a poor one is not knowing where they’re going. There’s a lot going on at casinos and things change quickly in the gaming industry, so it’s important to keep guests informed so they don’t waste time wandering around or feeling confused. Make it easy for guests to navigate between amenities and games with clear, visible signage. You can also integrate digital technology by sending updated information to guests’ smartphones. 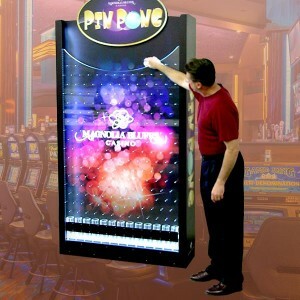 Increase on-site spending – Targeted advertising is a great way to boost sales and revenue, and casino signage is the perfect way to deliver that targeted information. 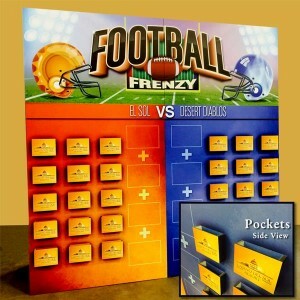 Encourage people to game longer with jackpot celebrations, drive sales with tournament promotions or make guests feel like stars by posing them in front of fabric banners. Boost engagement – Wall murals differentiate space and brighten up the casino floor. They are a great way to offer a unique brand experience that improves customer loyalty. Adding kiosks, touch screens and other interactive displays further promotes guest engagement. Create employee solutions – Guests aren’t the only ones you want to reach with signage; communicating with employees is also important. Signage can display information about upcoming events, recognize employees, promote training opportunities and more. Promotions – Signage and graphics are perfect for showing off the latest events and promotions. Eye-catching signage and crisp displays command attention and help to boost brand awareness and sales. Use digital signage to quickly and easily update the content. Hang large signage displays that include a strong call to action. Set up exciting life-like, die-cut standees in the shape of vehicles, celebrities and more. Make low-light space work for you with high-definition backlit displays. Utilize unused space with adhesive graphics that quickly attach to windows, elevator doors, floors and more for bold color that are easy to change. Match posters to existing décor to build excitement for concerts, giveaways and more. Meet guests where they are with slot toppers that offer eye-catching reminders of upcoming events. Casinos offer an exciting experience for guests. Our digital printing services can help take their experience to the next level. Communicate the right information to your guests and employees with high quality graphics and signage. 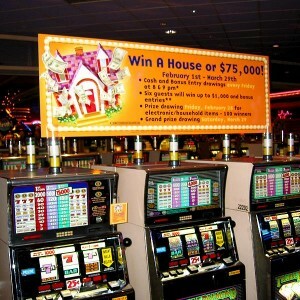 For more information on how we can help you with your casino graphics and signage, contact us today.